Bruce Irvin has rare speed for a defensive end. Even the draft experts that panned the Seahawks selection of Irvin in the first round freely admitted he was the best pure pass rusher in this draft. Yet, that speed was not enough to blow people away in the first three pre-season game when Irvin was not credited with a single tackle, let alone a sack. Irvin is heading into the season opener against a Cardinals team that is struggling to protect the passer and has unproven options at the tackle position. It seems ripe for the picking. Could Irvin dominate? Perhaps, but first it may be worth setting the bar for rookie playing in their first game. It might seem that a dominant pass rusher would burst onto the NFL scene as soon as they hit the field. A look through the best sack performances by rookies in Week 1 tells a different story. 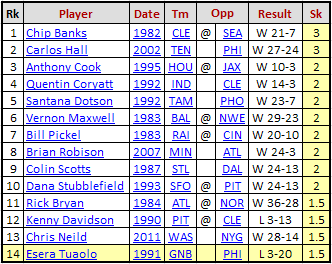 Only 14 rookies in NFL history have had more than 1.0 sack in their first game, and only 10 have had 2.0 sacks or more. That is not exactly a list of Hall of Fame pass rushers. Chip Banks and Dana Stubblefield were great players. Some of the rest had reasonable careers, but blowing up in the first game of your rookie season as a pass rusher does not seem to correlate much with having a great career. Things make much more sense when looking at the best rookie season sack totals. Thirty-one players have had 10.0 sacks or more as a rookie. Nearly all of them went on to have big careers. It would make sense that sack totals would increase as pass attempts rise. Aldon Smith nearly set the rookie record for sacks last season. It may be curious that Lawrence Taylor, one of the best sack artists of all-time, was nowhere to be found. Sacks were not officially tracked during Taylor’s rookie season. K.J. Wright recently said he’d bet a paycheck on Irvin getting double-digit sacks. Should Irvin accomplish the feat, his future as a pass rusher will almost certainly be bright. Don’t be surprised if his first game is not quite as remarkable.